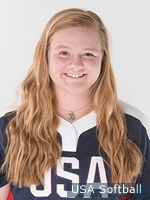 Lexi Kilfoyl is one of four players invited to tryout for the 2019 USA Softball Junior Women's National Team who played on the 2017 squad. Information and photos provided by USA Softball. USA Softball announced on Friday the list of athletes invited to participate at the 2019 USA Softball Junior Women’s National Team (JWNT) Selection Trials to be held December 28-January 1, at the Eddie C. Moore Softball Complex in Clearwater, Florida. Those athletes who accepted the invitation (see list below) to try out will vie for 20 spots on the 2019 USA Softball JWNT Training Team roster which will compete at the USA Softball International Cup. The roster will then be trimmed to 17 athletes to participate in the World Baseball Softball Confederation (WBSC) Junior Women’s World Cup in Irvine, Calif. August 11-17, 2019. During the selection process, athletes will participate in position drills as well as simulated games and be evaluated by the USA Softball Women’s National Team Selection Committee (WNTSC). Athletes who make the 2019 USA Softball JWNT roster will look to earn a third-consecutive WBSC Junior Women’s World Championship title, having claimed the previous two World Championships in 2015 and 2017. Highlighting the list of invitees are four members from the 2017 USA Softball JWNT: Julia Cottrill (Stillwater, Okla.), Gabi Deters (Bowling Green, Ky.), Lexi Kilfoyl (Land O’Lakes, Fla.) and Kathryn Sandercock (McLean, Va.). The complete coaching staff and schedule for the 2019 USA Softball JWNT will be announced at a later date. USA Softball will also hold an open tryout opportunity for players hoping to make the 2019 USA Softball JWNT on December 28 at the Eddie C. Moore Softball Complex in Clearwater Fla.
Information including registration on the open tryout can be found here. The application deadline is November 30, 2018 and eligibility is open to any female United States citizen born in 2000, 2001 or 2002 and who can commit to the necessary training time in the June, July, and August period is eligible. Participants from the open tryout could be selected to participate at the USA Softball JWNT Selection Trials along with the list of invited athletes. The invitee list is subject to change as additional athletes could be invited by the WNTSC at any time. For updates on the USA Softball Women’s National Team and events throughout the 2019 season visit www.USASoftball.com.